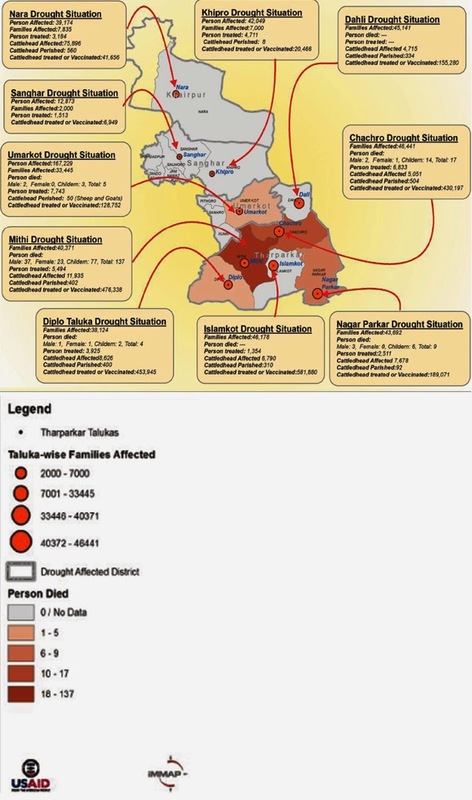 Haq's Musings: Thar Drought: Precursor of Dust Bowl in Water-Stressed Pakistan? Thar Drought: Precursor of Dust Bowl in Water-Stressed Pakistan? Deaths of dozens of malnourished and sick children after a 3-year drought in Pakistan's Thar desert have finally got the media attention and forced politicians to take notice of the unfolding tragedy. Emergency aid is now being provided by the Pakistani military and the civil society. And promises are being made by the politicians to do more for the poor, mostly Hindu, residents of the affected region. The Thar situation today reminds of what happened during America's Dust Bowl in the 1930s that lasted almost a decade. It forced millions of people in Arkansas, Kansas, Oklahoma, New Mexico, Nevada and Texas to migrate to other parts of the country, particularly California. Drought caused windblown dust and devastation of agriculture in the region. Some believe with good reason that the Dust Bowl accentuated and extended the Great Depression for several more years than would have been the case otherwise. Like the residents of the American plains affected by the Dust Bowl in 1930s, the people of Thar desert region rely on their crops and livestock for their livelihood. Since there is a very limited irrigation system in the area, they depend almost entirely on rains to grow their crops and raise cattle. The area currently affected by drought is relatively small but it could expand rapidly and turn into a much bigger tragedy unless the government and the people wake up to it. In addition to providing immediate relief, there is a strong need for a longer term strategy to improve water storage and irrigation in the region. It's not just Thar region. The problem that needs to be addressed is much bigger. Pakistan has increasingly been suffering from cycles of severe droughts followed by massive floods in the last few years. This recurring pattern of shortage and excess of water gives us a preview of the growing challenge of climate change. This situation calls for a comprehensive water management effort to deal with a potentially existential threat to Pakistan. Before the summer floods of 2010, the Indus had turned into a muddy puddle in parts of Sindh. Britain's Financial Times reported at the the time that "angry farmers marched through villages in Sindh demanding access to water. Those who can no longer turn a profit in the fields are increasingly resorting to banditry or migrating to urban shanties". Earlier, there was a 2009 report by the Woodrow Wilson International Center saying that the melting Himalayan glaciers have exacerbated Pakistan’s shortages. And the World Bank warned that Pakistan could face a “terrifying” 30-40 per cent drop in river flows in 100 year’s time. Now large parts of Sindh are under water for the second year in a row, destroying lives and standing crops. According to the United Nations' World Water Development Report, the total actual renewable water resources in Pakistan decreased from 2,961 cubic meters per capita in 2000 to 1,420 cubic meters in 2005. A more recent study indicates an available supply of water of little more than 1,000 cubic meters per person, which puts Pakistan in the category of a high stress country. Using data from the Pakistan's federal government's Planning and Development Division, the overall water availability has decreased from 1,299 cubic meters per capita in 1996-97 to 1,101 cubic meters in 2004-05. In view of growing population, urbanization and increased industrialization, the situation is likely to get worse. If the current trends continue, it could go as lows as 550-cubic meters by 2025. Nevertheless, excessive mining of groundwater goes on. Despite a lowering water table, the annual growth rate of electric tubewells has been 6.7% and for diesel tubewells about 7.4%. In addition, increasing pollution and saltwater intrusion threaten the country's water resources. About 36% of the groundwater is classified as highly saline. So what can Pakistan do to manage these disastrous cycles of floods and droughts? As the flood disasters took their toll , there were reports of USAID and ADB considering funding the $12 billion Bhasha Dam in Pakistan. The project is located on Indus River, about 200 miles upstream of the existing Tarbela Dam, 100 miles downstream from the Northern Area capital Gilgit in Gilgit-Baltistan region. The dam's reservoir would hold so much water that it could have averted last year's devastating floods. It would also provide enough electricity to end Pakistan's crippling shortages, according to a report in the Guardian newspaper. The massive dam on the Indus river would provide 4,500MW of renewable energy, making up for a shortfall causing up to 12 hours of load shedding on daily basis across Pakistan. The reservoir would be 50 miles long, holding 8.5 MAF (million acre feet) of water. In addition to large dams, there is also a need to build and maintain dykes and start other flood-control and overground and underground water storage projects and drill deep wells in areas like Thar, Badin and Thatta in Sindh. Building Bhasha and several other proposed dams will help in dealing with water scarcity, but the growing population will continue put pressure on the vital resource. 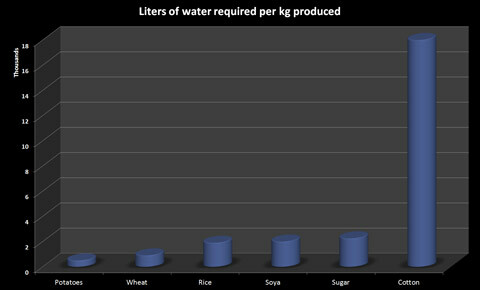 Serious conservation steps need to be taken to improve the efficiency of water use in Pakistani agriculture which claims almost all of the available fresh water resources. A California study recently found that water use efficiency ranged from 60%-85% for surface irrigation to 70%-90% for sprinkler irrigation and 88%-90% for drip irrigation. Potential savings would be even higher if the technology switch were combined with more precise irrigation scheduling and a partial shift from lower-value, water-intensive crops to higher-value, more water-efficient crops. Rather than flood irrigation method currently used in Pakistani agriculture, there is a need to explore the use of drip or spray irrigation to make better use of nation's scarce water resources before it is too late. As a first step toward improving efficiency, Pakistan government launched in 2006 a US $1.3 billion drip irrigation program that could help reduce water waste over the next five years. Early results are encouraging. "We installed a model drip irrigation system here that was used to irrigate cotton and the experiment was highly successful. The cotton yield with drip irrigation ranged 1,520 kg to 1,680 kg per acre compared to 960 kg from the traditional flood irrigation method," according to Wajid Ishaq, a junior scientist at the Nuclear Institute for Agriculture and Biology(NIAB). Beyond the government-funded experiments, there is a drip irrigation company called Micro Drip which is funded by the Acumen Fund. Micro Drip develops and provides products and services as poverty alleviation solutions to small farmers in Pakistan’s arid regions. It provides a complete drip irrigation system along with agricultural training and after-sales support to enable farmers to extract a higher yield from their land at a much lower cost of input. So what is holding up Pakistan's progress on water management? Pakistani government revenues continue to be limited by slow economic growth and widespread culture of tax evasion. The biggest culprits are the ruling feudal politicians who oppose any attempt to levy taxes on their farm income. The limited resources the state does have are usually squandered on political patronage doled out to ruling politicians' supporters in the form of capricious grants, huge loans (defaulted with impunity), and plum jobs in bloated government and the money-losing state-owned enterprises. The result of this blatant abuse, waste and fraud is that the budget allocations for vital long-term investments in education, health care and infrastructure development projects are regularly slashed thereby shortchanging the future of the nation. The NY Times has reported that "Washington’s fears of Pakistani corruption and incompetence has slowed disbursal of the money". The story reinforces the widely-held view that even after the funding is arranged, the corrupt and incompetent politicians and their hand-picked civilian administrators make any development progress slow and difficult. Such problems are further exacerbated by significant security issues in parts of the country severely plagued by ongoing militancy. It can be argued that the threat from climate change is bigger than the Taliban threat which gets all the coverage in Pakistan. Generations of military families have periodically fought FATA insurgencies. For example, Shuja Nawaz, the author of Crossed Swords says that his grandfather, his uncle and his cousin have all been deployed in Waziristan by the British and later Pakistani governments in the last century and a half. Pakistani military is quite capable of dealing with this threat to defeat the Taliban. Climate change and the growing water scarcity pose a bigger long-term existential threat to Pakistan and the region. Water per capita is already down below 1000 cubic meters and declining. What Pakistan needs are major 1960s style investments for a second Green Revolution to avoid the specter of mass starvation and political upheaval it will bring. As to the current Thar crisis, corruption, incompetence and poor governance have characterized the Pakistan People's Party rule at the federal level and in Sind province for years. What is happening in Tharparkar now is symptomatic of it. The PPP voters in Sind, particularly in Tharparkar, are mostly poor haris many of whom are followers of powerful landowning feudal pirs who represent them in Sind assembly and in the national parliament. The voters never hold their representatives accountable for their total neglect of their areas. Instead, the powerful and ubiquitous media born on Musharraf's watch is doing it, as are the Supreme Court judges. I think it's a good development in Pakistan which will likely help the poor who have so far been helpless. I hope that the media focus is not just on the current crisis in Thar at the provincial level but also on the larger national issues of water management, storage and irrigation infrastructure the country needs to avert a much bigger disaster in the future. You are claiming that Punjab should build more dams when you can literally walk across one bank of Indus river to the other along Kotri-Hydrabad bridge? There is zero water feeding Kalri and Haleji lakes, which has turned that water poisonous. The drought in Thar is the result of diverson of 100% of Indus water to Punjab. Recently, some people in our family were able to walk in the Indus river bed from Kotri side bank to the Huderabad side bank. There is zero water in Indus 10 miles down the Kotri bridge. Punjabis sold three rivers' water to India for 60 million pounds to use the money for lining Punjab's canals. Now those canals are fed water from Indus and Jhelum, whereas Jhelum was feeding Indus. All that water is used in Punjab. All the Indus delta mangroves are gone. Thar desert has billions of cu-m of subsoil water. But the Sindh government has zero money (and zero intelligence) to tap that. Thar desert has a very deep sand layer so all the rainwater is stored below grade as subsoil water, thus creating a more efficient reservoir than dams (and supply canals downstream) where evaporation losses are high. However, due to the deep sand bed, water is at a much greater depth than conventional wells. One of my friend's father, had started a welfare trust scheme digging deep wells in Thar villages, and Iqbal is still continuing it. So it is a proven fact that water shortage in Thar can be easily overcome by digging deep wells without going into mega schemes which will never materialize, and even when done will not help Thar water problem. People living in Thar areas bordering India say that villages on Indian side are fully developed with no water or infrastructure shortage. The only reason for Thar water crisis is the extreme incompetence of PPP governments, and the extreme stupidity of Sindhi people who continue supporting PPP regardless of the losses they're suffering even at personal levels. where crops are mainly dependent on rainwater. not be controlled, most probably due to lack of systematic exploration & development of deep groundwater potential. Management of the available water- resources is also not adequate,even to sustain a short period of drought-cycle. On recurrence of a drought-cycle, a significant section of the population is compelled to migrate towards other parts of the Sindh province, which affects their socio-economic stability. Rate of annual rainfall increases from northwest to southeast (Figure-1). In the north of the Thar Desert, a, low rainfall region (with an average annual rainfall of less than 100 mm), exists around Rahimyar Khan. the rainfall is erratic and continuous spells of droughts, lasting for up to four years, have been experienced. the nearest topographic low, as sheet flow that eventually either evaporates and/or infiltrates. area becomes "Green Hilly Thar"
1. The present study indicates remarkable groundwater potential in the Thar Desert. Three sources have been identified: the bottom of the Dune Zone, the coal-bearing sedimentary units, and the basement. A subsistence economy existed in the Thar before the 1960s and the barter system prevailed amongst the peoples there and in their ties with the outside world. The desert people produced almost everything they needed for their existence, manufacturing even cloth, shoes and blankets locally. Their food consisted almost entirely of millet bread (bajre ki roti) and yogurt (lassi). Such items as tea, biscuits and city-made clothes and shoes were unknown and there were no shops in Thar villages. Animals were rarely sold for cash and the people"s only source of income was from the sale of ghee. However, from 1947 onwards, there was a slow process of change in the desert, with a move to a cash economy and the integration of its economy with the Karachi and Hyderabad markets from 1972. Pakistan"s Tharparkar district can be divided into two distinct areas: the barrage lands and the desert. The desert has a total area of 22,000 sq km and a population of about 800,000 -- which is approximately half the population of the district and more than 70 per cent of its land area. As late as 1960 the district had not produced any doctors, engineers, lawyers or administrators and it had only a negligible number of teachers at the secondary school and college levels. Today, the district can boast of more than 4,000 professionals and the high school population has risen from about 7,500 in 1972 to well over 20,000 today. Tharparkar professionals constitute an increasingly powerful political lobby from which a number of politically important figures is emerging. The Thar lobby"s demands and concerns are no different from those of the peoples of Pakistan"s other arid and backward regions. However, they acquire both urgency and seriousness because they are supported by Karachi-based professionals, political figures and intellectuals. The discovery of the Thar desert is part of the discovery of Sind by liberal Western circles in Karachi. Necessitated by the country"s political situation in 1965-75, this discovery stemmed from the need of the second generation of post-Independence Karachi residents to establish a relationship with the "culture of the soil". In the case of the Thar desert, with its fascinating ecology and colourful culture, this relationship acquired romance and passion. Karachi"s first major contact with the Thar came in the wake of the Indo-Pakistan war of 1971, when a sizeable part of the desert population had to move out of the war zone. In order to survive, migrating Tharis were forced to sell their valuables to middlemen who resold them in the Karachi market. Soon, Thari rugs adorned the drawing rooms of Karachi"s elite and high society women took to wearing silver jewellery, cholis and embroidered shawls from the desert. This was the beginning of a regular trade in handicrafts that continues to this day. QUETTA, Pakistan, March 13 (UPI Next) --Drought and power shortages have decimated agriculture in parts of Pakistan's largest province, Balochistan, and driven local villagers to Quetta, the provincial capital. Gulistan, a town on Balochistan's dusty border with Afghanistan, is one such place. For decades, trees and vines bore apples, grapes, pomegranates and peaches that were sold in markets across Pakistan and abroad, yielding Gulistan's residents comfortable lives. Now, years of drought caused by climate change that have dried up channels that used to bring water from the mountains, electricity shortages resulting from Pakistan's insufficient national power grid and militant attacks, and water storage scarcity stemming from inadequate dam construction have forced villagers from Gulistan to abandon their homes and orchards. Dead tree trunks along the road are all that remain of the lush fruit groves that once defined the town. "Twenty years of drought and attacks by separatist militants on electricity grid lines have destroyed our crops and orchards at a cost we estimate at billions of rupees," Haji Abdul Rehman Bazai, secretary-general of the Balochistan Landowners Association, told UPI Next. "The land I own was capable of providing 200 [220-pound] bags of wheat, enough cumin, vegetables, apples, grapes, pomegranates, melons and watermelons," Haji Muhammad Essa Khan, a landowner from Gulistan's Qilla Abdullah district, told UPI Next. Before the drought, there were 3,325 ancient watering channels, Bazai told UPI Next. "We used watering channels for irrigation. Underground tunnels were constructed to gather subsoil water, by gravity, at the foothills. This water was then either taken to the fields and villages through vertical shafts sunk underground, or it was drawn out at the foot of the hill where it was gathered," Bazai said. These channels --'Karez' in the local Pashto -- used to bring water from nearby snow-clad mountains. However, drought has dried up 95 percent of these watering channels, Faiz Kakar, program manager at the International Union for Conservation of Nature, said. He said the channels were initially used for drinking water and were used for farming purposes in some areas. Mithi (Pakistan) (AFP) - As the death toll from the latest outbreak of poverty-driven diseases in Pakistan's Thar desert nears 100 children, experts are warning that corruption and a dysfunctional political system make a repeat of the disaster almost inevitable. The desert region in Tharparkar, one of Pakistan's poorest districts, spreads over nearly 20,000 square kilometres (7,700 square miles) in the country's southeast and is home to some 1.3 million people, including a large population of minority Hindus. Between March 2013 and February this year, rainfall was 30 percent below usual, according to government data, with the worst-hit towns of Diplo, Chacro and Islamkot barely touched by a drop of water for months. Asif Ikram, the second most senior administration official in the district, told AFP on Thursday that the death toll from diseases such as pneumonia and meningitis since December 1 had risen to 161 people, including 97 children. Life in the desert is closely tied to rain-dependent crops and animals, with farmers relying on beans, wheat, and sesame seeds for survival, bartering surplus in exchange for livestock. The drought is not the only reason for the recent deaths -- observers say they have come about as a result of endemic poverty, exacerbated by the drought and an outbreak of disease killing livestock. Authorities have been busy dispensing food aid and sending medics to attend to the sick following visits by Prime Minister Nawaz Sharif and Bilawal Bhutto-Zardari, who leads the Pakistan People's Party which rules the province. But observers say the relief work fails to address the root causes of such disasters and warn they are likely to be repeated. A drought in the desert in 2000 killed 90 percent of the livestock. Zafar Junejo, chief executive of Thardeep Rural Development Programme (TRDP), says the region has long been ignored by Karachi, the provincial capital, because it is not considered an important constituency politically. According to the last census, Hindus make up 40 percent of the district's population, unlike most of Pakistan which is overwhelmingly Muslim, and Junejo said the authorities have little concern for the suffering of minority communities. "We are fortunately or unfortunately a mixed Hindu and Muslim population," he said. While Suhail may claim PPP incompetence, the fact is that Punjab is getting nearly 70% of all Sindh's gas for literally free, and to top that, OGDC is earning nearly a billion dollars in profits on that. Sindh has zero secretaries in the federal government and Punjabis decide how much to dole out to Sindh. All the garbage from KP and Punjab lands in Karachi and is a huge burden on Sindh which is spending nearly 70% of its money on security, mostly in the form of salaries to the Punjabi rangers and Shaukat Hayats. After the implementation of the 18th amendment, revenue from GST (@17%) is now going to provincial governments. Sindh govt. has extended the coverage of GST to a wide range of services including small businesses such as boutiques, hair dressers, accountants, legal and medical practitioners, software houses etc (restaurants were already included). With Karachi still representing by far the biggest share of country's economy through its industry, commerce and services sectors, this is windfall income for the Sindh govt that has further distracted their attention from all governance functions, focusing only on how to misappropriate more money. Regarding Thar tragedy, the only action that Qaim Ali Shah took was dismissal of the Relief Minister, Makhdoom Jamil S/O Makhdoom Amin Fahim, while taking no action against his son-in-law who was a top bureaucrat related to the same functions. Yesterday, there was a patch up between Makhdoom Amin and Qaim Ali Shah and Makhdoom Jamil was reinstated. All Sindh govt actions regarding Thar negligence thus stand finished and things back to normal. The only difference is that the Sindh govt now has Rs. 1 billion of additional funds at its disposal, donated by Nawaz Sharif, probably the reason for mending fences within PPP leadership. With PPP around and Sindhis continuing their support to it, Punjabis have very little to do for keeping Sindhis in subjugation. Plus the fact that Sindhi leadership, PPP as well as nationalists, sell themselves cheap makes the task of Punjabis even more easy. So if you want to liberate Sindh from Punjabis, you'll need to change the Sindhi mindset first, or sell the idea of colonizing Sindh to the Americans. On my visit to Karachi, my bright nephew who is studying economics echoed what I believe is the voice of the youth there. Corruption, mismanagement, poor allocation of resources and cronyism shaves off a big chunk of Pakistan GDP growth. The water problem you highlight is not due to scarcity alone but poor governance. For that we cannot blame the US or the British Raj or hostile neighbors but the disease is internal. How much GDP growth is affected now and in the future? The problem is the politicians talk big and come up with grand plans but then everything gets fizzled. You have not answered the question regarding things like - nearly $17 billion worth of natural gas being given to the Punjab at zero cost. What is a f---- Rs 1 billion compared to that. Giving away gas at low cost and such things are correct. But given the total lack of capacity of PPP government, had the $17 billion been at their disposal, all of it would have been misappropriated and nothing invested into Sindh. This is exactly what I'm saying. Unless Sindh undergoes a renaissance or is colonized by Americans rather than Punjabis, it cannot develop. Last night, there was a news item about a peace deal between the two criminal gangs of Lyari, Uzair Baloch and Baba Ladla gangs. The deal was brokered at the Hyderabad residence of Ayaz Latif Palijo, where Uzair Baloch's negotiating team was led by the Lyari PPP MPA. You can well imagine the total lack of concept of governance when PPP legislators are openly representing the top criminal gang of Karachi. With such lack of capacity, Punjabis are having a field day. The current acute energy crisis in Pakistan, certainly the worst of all times is heating up an indigenous extractive resource scramble in a remote part of Pakistan with unusual demographics. The Tharparker District or simply the Thar Desert located in the southeastern province of Sindh is under spot light because of a 175 billion tons of estimated coal reserves lying beneath its surface. These reserves have been known for around two decades, but only recently has development gained momentum to generate power in order to propel the country’s ailing economy. The signs of a resource boom are already animating the dull landscape of the region – roads, airports, site offices, power lines, guest houses and rising real estate price are evident. Near the town of Islamkot, an underground coal gassification pilot project represents the scale of possible change where workers sourced from local communities rest their heads after long-hour shifts. Understanding the quandary faced by the residents of the Thar Desert took me to several villages situated in the vicinity of the coal fields to gather some basic ethnographic data on community perceptions of the project. Tharparker is home to around 1.5 million people stretching its boundaries with Indian Rajasthan and the Great Ran of Kutch salt marsh. The indigenous communities of Menghwar, Kolhi and Bheel make up a large part of the rural human settlement. The land is famous for rippling sand dunes, distinct folklore, rain-starved shrubs, drying wells, bottomed indicators of health, poverty and education and the most food insecure district in the country. One of the villages Mauakharaj of Tharparker, just beside an airport being built to host coal companies, has abject poverty and deprivation. The whole village is culturally and socially crippled because of fluorosis; a disease caused by consumption of excessive fluoride in groundwater, with no remedy and still people compelled to use it. The conversation did not lead to consensus on what approach should be dominant but there was a agreement that Thar coal development should not be a first resort but much further down the priority scale for addressing Pakistan’s energy crisis. As Pakistan’s election approaches, energy is a ballot issue and polemics are rife on panacea solutions. It is high time that Pakistanis consider their energy predicament with a multifaceted strategy that transcends petty nationalism so that communal harmony is not compromised for short-term and inefficient power solutions. Very timely article, sir. Looks like the rot is spreading to Cholistan. Also I wud have wished that apart from high investment strategies like drip irrigation and dam building you had focussed on water and soil conservation and organic farming. Higher soil organic C content substantially increases retention of rain water and reduces dependence on irrigation, which is always a more dangerous and not to say expensive source of water. The U.S. Agency for International Development (USAID) seeks bids to provide financial advisory services to the government of Pakistan for Pakistan's proposed 4,500-MW Diamer Bhasha hydroelectric project on the Indus River. Bids are due October 27. USAID awarded a contract in September to MWH Global to perform an environmental and social impact assessment of Diamer Bhasha. It was reported last year that the World Bank and Asian Development Bank agreed to help finance construction of Diamer Bhasha (also spelled Basha). 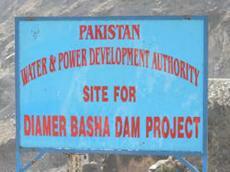 Pakistan recruited firms in 2009 for design, construction supervision, and contract administration of Diamer Bhasha, which includes a 272-meter-tall roller-compacted-concrete dam, two diversion tunnels, two underground powerhouses of 2,250 MW each, a permanent access bridge, and hydro-mechanical and steel structural equipment. USAID/Pakistan now seeks bids for financial advisory services in regard to financing Diamer Bhasha. Work is to include development of a financing strategy for the project, assistance in financing decision making and financial closure, and development of a computer-based financial model for the project. The work is expected to require one year at a cost of US$2.5 million to US$2.9 million. The U.S. Agency for International Development (USAID) seeks bids to perform a technical engineering review and upgrade of plans for Pakistan's proposed 4,500-MW Diamer Bhasha hydroelectric project on the Indus River. Bids are due November 17. USAID also has called for bids by October 27 to provide financial advisory services to the government of Pakistan for Diamer Bhasha. It awarded a contract in September to MWH Global to perform an environmental and social impact assessment of the project. USAID has pledged US$200 million toward development of Diamer Basha, with funds to be used for assessment of environmental and social effects of the proposed project as well as preparation of a financial package. The project is to include a 272-meter-tall roller-compacted-concrete dam, two diversion tunnels, two underground powerhouses of 2,250 MW each, a permanent access bridge, and hydro-mechanical and steel structural equipment. USAID/Pakistan now seeks bids for technical assessment, review and upgrade of the engineering design, cost estimates and documentation for Diamer Bhasha. The work is expected to require one year at a cost of US$5.59 million to US$6.59 million. A solicitation notice may be obtained from the U.S. Federal Business Opportunities Internet site, www.fbo.gov, by entering Solicitation No. AID39114000059 in the "Keyword/Solicitation #" box. Bidders are to submit separate technical and cost proposals by 4 p.m., U.S. Eastern time, November 17. For information, contact Maria Hassan, Acquisition and Assistance Specialist, Department of State, USAID Unit 62206, APO 09812-2206, Islamabad, Pakistan; (92) 51-2081285; E-mail: mahassan@usaid.gov. KARACHI: Asia's largest reverse osmosis plant, having a capacity to produce two million gallons of water daily, was inaugurated today in Pakistan's drought-ridden Sindh province. The plant which is billed to produce two million gallons of water per day is expected to reduce the water crisis in Tharparkar district where last year hundreds of children have lost their lives by drinking untreated water. Former President Asif Ali Zardari inaugurated the plant. Zardari, who is also co-chairman of the Pakistan Peoples Party which heads the province, said his party was committed to provide clean drinking water to the people of the area. Zardari said Asia's biggest RO plant has been set up at a cost of Rs 300 million while many smaller plants having a capacity of 10,000 gallons per day have also been set up across the region at a cost of around Rs 2.5 million each. The Sindh government plans to install 300 reverse osmosis (RO) plants in water-starved regions of the province by February. The number of the ROs already made operational is 150. Irshad Hussain, the chief operating officer of Pak Oasis, the company that has been working in Thar's water sector since 2004, said the government had allocated Rs 5.4 billion allocated to set up RO plants in the region. He said these plants can be operated through electricity or solar energy and steps were being taken to convert most of the filter plants to solar energy. "It is solar energy that matters here in this region as it makes operation of ROs cost effective," he added. Taj Haider, a senior PPP leader who is overlooking the operation in the region said: "For years now people living in the region have had to travel several kilometres to fetch a few buckets of clean water from reservoirs in their area. The situation is going to change now for the people of Tharparkar. Reverse osmosis plant uses a purification technology that remove salts and other pollutants from water. The last time I was in Tharparkar in 2000 it was to report on one of the more severe droughts this region has experienced. Fifteen years later, in some ways much has changed. Back then, I remember travelling for hours on sandy tracks in a rickety old World War Two American truck called Kekra (meaning tortoise). These slow-moving trucks were the main mode of transport between border towns and the district capital Mithi. Today, there are shiny new roads linking most of the major towns in Thar. Back then, radio was the only mass medium and news travelled by word of mouth. Today, the arrival of mobile phones in the main villages has transformed the way people can connect with each other and the rest of the world. Electricity infrastructure is still lacking. But solar power has gained momentum. Travelling in Thar these days, it is not uncommon to come across roadside vendors offering to charge your mobile phone using solar panels. And yet, despite these improvements in communications, social sectors like health and education have continued to suffer. This region has one of the highest infant mortality rates in the country. On most measures of development, Thar is at the bottom of Pakistan's 120 districts. Doctors and nurses are hard to find. Qualified medical staff from the region often leave to earn much more money in big cities like Karachi. In Thar, there are many villages without schools and many schools without teachers. It's part of an overall crisis of governance, say critics. They blame the provincial government of Sindh - run by the party of former president Asif Ali Zardari - for corruption and institutional failures. But the government defends its performance by pointing to its massive investment in a new scheme to bring clean drinking water to the region. The $33m project involves installing 750 water purification projects in villages across the desert region. Of these, as of this month, about 280 have already been installed, says PakOasis, the company running the project. The scheme is being billed as a ray of hope for Thar. It uses imported Danish technology to pump underground water. Impurities from the water are then removed using American membrane technology. The filtration process is called Reverse Osmosis (RO). Each RO plant runs on zero-electricity cost. It is powered by solar panels imported from China. The biggest of these water plants stands on a hill near Mithi. It has the capacity of purifying 2 million gallons of water daily. At its full capacity, it is expected to benefit 300,000 people. The project was meant to go online later this year. But reeling under heavy public criticism for not doing enough, the government inaugurated it with much fanfare in January. The Pakistan Army distributed 25 tons of rations among the affected people of Chachro in district Tharparkar in a two-day long relief operation. According to the Inter-Services Public Relations, besides provision of rations the army doctors also treated over 1,200 patients at the medical camp. Over the last year the Pakistan Army has distributed 574 tons of rations among 36,000 families and has treated over 40,000 patients. "Who would give their daughter to this village?" That's the question posed by one man in an Indian village devastated by an ongoing drought in the country. The majority of young men in Gopipur, in the Chitrakoot district about 400 miles south of New Delhi, say that the shortage of water, and its crippling impact on the local economy, has made it harder for them to get married. It's one of the unexpected social consequences of a drought that the Indian government now says is affecting at least 330 million Indians. BBC Pop Up went to the community where nearly 5,000 people rely on a small naturally-fed well for drinking and bathing water. Human migration attributable to climate events has recently received significant attention from the academic and policy communities 1, 2. Quantitative evidence on the relationship between individual, permanent migration and natural disasters is limited 3, 4, 5, 6, 7, 8, 9. A 21-year longitudinal survey conducted in rural Pakistan (1991–2012) provides a unique opportunity to understand the relationship between weather and long-term migration. We link individual-level information from this survey to satellite-derived measures of climate variability and control for potential confounders using a multivariate approach. We find that flooding—a climate shock associated with large relief efforts—has modest to insignificant impacts on migration. Heat stress, however—which has attracted relatively little relief—consistently increases the long-term migration of men, driven by a negative effect on farm and non-farm income. Addressing weather-related displacement will require policies that both enhance resilience to climate shocks and lower barriers to welfare-enhancing population movements. Last week I had the chance to visit Thar again after more than a decade. While it remains an extremely poor and least developed region of the province of Sindh, I was struck by a few changes that have the potential of transforming the region into a vibrant economic player. Water is the most basic need in a desert. Last time round, I observed that Thardeep, a rural support organisation that has worked in the area since the early nineties, had achieved some success in improving provision and quality of drinking water in selected areas. Traditional birth attendants, some dispensaries and a few “barefoot” doctors was all that it could manage in the field of health. It also ran a number of schools. Linkages between craftswomen and middlemen from the market were few and far between. Government presence was minimal. The district hospital in Mithi was a mess. Roads were almost nonexistent. Fast forward to August 2016. The road from Karachi to Thatta is a shame and Thatta to Thar via Badin is tolerable. Enter Thar and it is a different world. The main road here is probably the best highway of Sindh. It leads to coal mining areas, power stations and the gasification plant. Coal mining is a joint venture of the Government of Sindh and ENGRO, subcontracted further to a concern named Bilal. There is no knowing whether usable coal will eventually be available to the power plant being constructed next door. The coal gasification plant is no more than a monument to our atomic veteran. The impact of the road, augmented by mobile connectivity, is multidimensional. Walking long distances has given way to motorbikes and overloaded buses have taken the place of kekras, the rickety shuttle truck-bus of the World War II vintage. Children suffering from malnutrition and other ailments are reported directly to the media as well as the hospital in Mithi on mobile phones. The high numbers of the suffering children had always existed; only the media was late in discovering these cases. The media attention did bring politicians and bureaucrats to the region, facilitated of course by the road. The hospital in Mithi is now much better staffed and well-stocked with medicines. It is now a thriving town with a good number of schools and a college. Even an English-medium private school was in evidence. A sub-campus of a university is also coming up. Locals complained about the lack of girls schools, especially at the post-primary level. This is a sign of growing awareness. There was also frustration that the locals are not given the party tickets for the National and Provincial assembly seats. 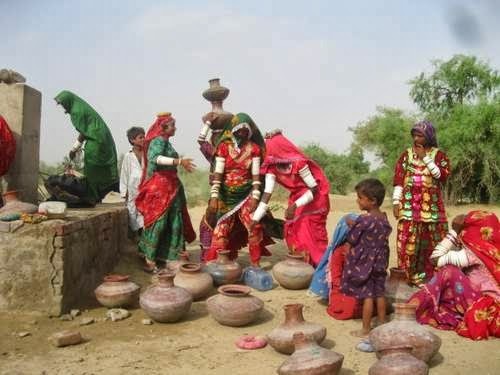 Mobile connectivity and the road have linked the famous craftswomen of Thar with the main markets much more effectively. At a community meeting in Islam Kot, women were quoting prices that broadly corresponded with the prices charged in Karachi’s Zeb un Nisa Street. Another change is the large number of government buildings, most of them left incomplete. Many that are completed, are uninhabited. Those complete and inhabited are poorly maintained. The tourist complex built at the legendary Marvi well is a case in point. A beautiful tourist complex in Nagar Parkar, designed by friend Arif Hasan, funded by Sindh’s Planning and Development Department and managed by Thardeep is another case in point. At the end of the day, there may or may not be good quality coal or power, but the very presence of the road is rapidly opening up the area. As for power, the people are beginning to learn that the best off-grid solution is the sun that shines over Thar most of the time. I, though, had the good fortune of witnessing rains and greenery in a desert — an exhilarating experience. Chinese company, the Elion Resources Group (ERG), is eager to turn Cholistan desert, Thal desert, Indus Valley Desert, Thar Desert and Kharan desert into oasis by implementing ecological system, eco-environment infrastructure and mechanism of technological innovation. Plan vision aims to reclaim land from sand by promoting vegetative cover, establishing forest (Afforestation and reforestation), controlling desertification, developing severe weather-resistant cultivable lands and uplifting the lives of locals through innovating husbandry, pharmacy and tourism. ERG, being one of the largest desert ecology enterprises in the world, Dr. Javed Iqbal, PhD in environmental Sciences and Engineering says, is capable to change disadvantage of deserts into advantage. “It has done wonders by rehabilitating China’s ecology system, promoting China’s eco-civilization and green economy at the national level and boosting global green civilization, the betterment of eco-environment in desert areas, poverty eradication and green economy development by utilizing cutting-edgy scientific technology,” he says. During an intensive talk with 8-member Pakistan delegation who recently visited Inner Mongolia China, He Pengfei, executive general manager of branding, Elion Resource Group shows avid interest in changing the fate of Pakistani deserts. He cited the example of Kabuqi desert in Inner Mongolia, seventh largest desert in China which was once a barren land, uncultivable area with no water, no electricity and no future. The ecological industry, he claims, in the desert has provided over 5000 employment opportunities for local peasants and herdsmen, while free professional training has also been provided to make them the new-generation ecological construction workers, tourist service staff and skilled workers of intensive breeding and planting. Thar Desert spans an area of 175,000 square kilometers. It is the seventh largest desert on the planet and the third largest in Asia. Agriculturist Dr. Humayun Faisal says that Pakistan governments, in past, launched some projects to increase the prospects of irrigation and cultivation in the Thal desert by unveiling Greater Thal Canal project (phase I and Phase II) costing Rs. 30 billion in 2001 but unfortunately project stands incomplete so far. Under the current fiscal budget, Punjab Provincial Development Working Party again allocated Rs 6261.701 million for Greater Thal Canal Project (GTC) -Phase-II (Chaubara Branch). If Chinese company, the Elion Resources Group (ERG) and Pakistan concerned quarter agree for desert projects, including GTC and others will bring revolutionary changes in the region and uplift the lives of local people who are forced to lead a nomadic and semi-nomadic lives with meager avenue of livelihood, education , health and other civic facilities, he hopes. China and Pakistan have inked a memorandum of understanding (MoU) for the construction of two mega dams in Gilgit-Baltistan, a part of India’s Jammu and Kashmir state that remains under latter’s illegal occupation. The MoU was signed during the visit of Pakistan’s Prime Minister Nawaz Sharif to Beijing for participation in the recently concluded Belt and Road Initiative. The two dams, called Bunji and Diamer-Bhasha hydroelectricity projects, will have the capacity of generating 7,100MW and 4,500MW of electricity respectively. China will fund the construction of the two dams, investing $27 billion in the process, a report authored by Brahma Chellaney in the Times of India has noted. According to Chellaney, India does not have a single dam measuring even one-third of Bunji in power generation capacity. The total installed hydropower capacity in India’s part of the state does not equal even Diamer-Bhasha, the smaller of the two dams. The two dams are part of Pakistan’s North Indus River Cascade, which involves construction of five big water reservoirs with an estimated cost of $50 billion. These dams, together, will have the potential of generating approximately 40,000MW of hydroelectricity. Under the MoU, China’s National Energy Administration would oversee the financing and funding of these projects. The current rain spells have changed the landscape of Thar Desert, filling natural water ponds and recharging underground water in the entire Tharparkar and parts of Umerkot districts. People expect several wild fruits and vegetables to bloom in the coming weeks, which would improve food security in the Tharparkar district. Mushrooms and other wild leafy vegetables have already started flooding the local markets, creating hope for the people, who were in need of rich nutrient food at their doorsteps. He said many vegetables and fruits are expected to arrive in the markets within a few days, which would be easily accessible for all the people. Siddiq said round gourd (tinda) would arrive in the market after 20 days, melon family fruits in 30-days while green watermelon, mostly cooked as a vegetable, would be brought to the local bazaars in 45-days. He works in the fields of water management and indigenous tree plantation, and also motivates the local communities to establish kitchen gardens in the desert villages. Siddiq has knowledge about the traditional practices in the desert, especially regarding pre and post rain harvest. “Rain is a blessing for the desert people after a long dry spell which depleted plants and trees, and degraded the water sources of the region,” he said. Thar Desert has experienced the worst situation for two consecutive years in terms of food security, unsafe water sources, malnutrition among children, and frequent reports of deaths of newborn babies in scattered areas. Doctors attributed these deaths of babies to the poor diet of mothers. “After prolonged dryness, fear of shrinking water sources and drought-like situation, these rains have created hope for families, who can live safely,” Siddiq added. Information gathered from different areas revealed that for now grasses were at a growing stage on sand dunes and plains. It was only benefitting small animals, goats, and sheep. Herders expect more grasses to grow in the following days, which would benefit all animals. Local mushroom varieties, known for their delicious flavour, have flooded the local urban markets. However, due to lack of preservation technology and poor storage and processing mechanism, this well-known edible item has a very short shelf life, and large quantities often go to waste. About the traditional process of fodder stocking for winter, local community elders said it depended on the rains. If the desert received five-seven showers within a few days, it would benefit farmers, who would be able to cultivate their lands to grow all the traditional crops and also grasses for livestock rearing. Traditionally, people collected fodder after the rainy season ended and kept it in stock for using during winters. Currently, the grass stocks would be enough for the next three months. However, to make the stocks last till winter, the region should receive more heavy rains as per the communities, so they could have access to sufficient food and fodder. The desert communities mostly depend on rain-fed farming and livestock rearing. Thar has around six million livestock population. They call this timely rain a blessing and believe it would benefit all the people, water sources, lands, and livestock. Umerkot livestock deputy director Dr Ganesh Kumar Khatri in his updates warned herders to be careful, and said it was common for small and weak animals to fall prey to certain viral infections during this season. Apart from viral infections, eating harmful and alien grasses or drinking stagnant water could also cause problems for animals. stability of the people of the region. Sindh’s Thar Desert has witnessed severe drought in the past four years. The long dry spell caused acute shortage — of food for humans, fodder for livestock and water for wildlife. During this worst drought in the recent history, hundreds of infants have died of malnutrition. The famine like situation has killed not just livestock, an important source of livelihood, but also wild species. But the recent monsoon rains had a magical effect on the desert which has turned green from brown, promising good times ahead not just for humans but wildlife as well. At the same time poaching and trafficking of baby wild animals including peafowl, deer, partridge and wild rabbit in the region is picking up. Thar Desert is home to around 300 species of mammals, birds and reptiles. Prolonged drought had impacted the economy, society and environment of Thar Desert. Natural water ponds (locally known as Tarae) dried up and ground water level deepened, affecting all forms of life. There was no cultivation. Green pastures, which are the main source of food for livestock and wildlife, had depleted. Locals would spend most of their time in search of food and water. In the drought years, almost half of the total population of locals migrated along with their cattle to the neighbouring barrage areas in search of food. So did the wildlife species. Although last year there were some rains in the desert they were not on time, hence not beneficial for locals as they could not cultivate crop due to delayed rains. Also, there was no greenery. This year monsoon arrived on time. The desert received the first rain in the beginning of July that continued for several days, restoring the beauty of the desert. Rain has provided the much-awaited relief to the living beings and natural habitat. Thar Desert is recovering from the bad impacts of drought. Wetter Thar means greenery and pastures all around as this part is considered the most fertile desert. There is greenery on vast areas of sand dunes locally called ‘Bhit’. That also means better food supply to flora and fauna of the area. Much of Thar Desert’s portion lies in Tharparkar district of Sindh, stretching over 22,000 square kilometres. 300 kilometres east of Karachi, along Indian border, it has faced persistent but periodic droughts for the past several decades. Despite being water scarce, agriculture and livestock remain the major sources of income for majority of the population in Balochistan, Pakistan’s largest and most sparsely-populated province. Over-pumping of groundwater in the past resulted in the depletion of fresh water resources at the annual rate of three meters. The Government of Balochistan, with the World Bank’s support improved and restored 15 independent Karez systems in collaboration with Farmer Organizations, helping increase productivity, crop yields, and farmers’ incomes. Constituting almost 44% of the country’s total land mass, Balochistan is the largest province of Pakistan, with a population of nine million people. Despite being water scarce, agriculture and livestock remain the major sources of income for majority of the highly dispersed population. The average annual rainfall varies from less than 50 mm in the southwest to about 400 mm in the northeast of Balochistan. With a largely arid climate, surface water and ground water sources can only be replenished by scarce rainfall. Very high evaporation rates make irrigation systems a necessity for agriculture. During the drought period between 1998 till 2002 in Pishin Lora Basin, located in northwest Balochistan, the number of tube wells swelled. The problem became more acute because of continued over-pumping of groundwater resulting in the depletion of fresh water resources at an annual rate of three meters. Considering such tough conditions, the World Bank, at the request of the Government of Balochistan (GoB) initiated Small Scale Irrigation Schemes (SSIS) under the umbrella of Balochistan Small Scale Irrigation Project (BSSIP) to improve the management of scarce water resources. The idea was to increase surface water availability and reduce groundwater depletion while strengthening local capacity through participation of farmers in implementing these schemes and formulating plans for sustainable water resources development and watershed management. Karezes, are the main source of irrigation and drinking water needs in Balochistan. These are underground galleries that tap groundwater from aquifers of the alluvial fans. Underground tunnels with gentle slopes carry water from its source to settled areas. These are small in cross-section but may be many kilometers in length. Karez water is used for irrigation and for drinking water supply. This is a reliable source of water supply given the climatic conditions of the province and is a relatively economical method of tapping groundwater for irrigation, environmentally safe and powered by gravity. Under the SSIS, the Government of Balochistan, with the help of the World Bank improved and restored 15 independent Karez systems in collaboration with the Farmer Organizations in Pishin Lora Basin. The water conveyance channels from the source to the farms were mostly made of earth, causing almost half the water to be lost to seepage. Thar Desert can easily be converted into lush green grassland if it is irrigated with saline water, say researchers. According to details, researchers at Institute of Sustainable Halophyte Utilization, University of Karachi have successfully developed a cropping system that can turn barren saline lands into sustainable croplands mainly for animal fodder and other important by-products like medicines and bio-fuels. The fodder grass is a perennial sown once and can be continually harvested to about 63,000 kg per hectare per year without reseeding. ISHU inked a MoU with SECMC, for developing model cash crop cultivation farms in Thar Desert to grow green fodder on experimental basis. Utilising brackish water in Thar will reduce pressure on fertile lands and sweet water resources. The crops were being watered by underground saline water pumped from a level of 180 metres from the pen-pit coal mine. Plantation of the fodder plant has been successfully started near Green Park at Thar Block II. Thar is the largest desert of Pakistan and 9th Largest Desert Of the world. It is situated in the province of Sindh. The Thar area has a tropical desert climate. The rains play a vital role in the life of all parts of Thar because the underground water is rarely found in Thar desert. Most of the underground water is saline and undrinkable sometimes sweet water comes out of a very deeply dug well. Director ISHU Prof Dr Bilquees Gul said that this bio-saline agriculture project with SECMC will play a vital role to take care of the local communities of Tharparker and nearby areas. She added that beyond traditional horticulture and agriculture, halophytes – salt-loving plant species – are cultivated in saltwater. These hardy plants, often already well adapted to desert conditions, are highly promising sources of fodder and bio energy feed stocks that can thrive in highly saline environments. ISHU, KU team has been offered a land, near Green Park at Thar Block II. SECMC team shall provide water, land levelling tools, equipment shed and other items to start formal growing plants, she added. Director ISHU said that proposed species of fodder can survive in local climate conditions. We have made significant progress in research on this subject and believe that if properly implemented, it could contribute significantly in rehabilitating saline land and providing fodder to arid areas like Thar have plenty of saline water resources. The communities along the Tharparker are extremely poor and the introduction of this grass in that area would provide an economic uplift to local communities, she said. Tests on animals have shown no harmful effects and there was no problem convincing people to use it as fodder,” she said, adding that good management was required to grow the grass, which was probably the best fodder grass for the sub-tropical regions of the world as it can grow from coastal regions to inland regions. Vice Chancellor Prof Dr Muhammad Ajmal Khan has congratulated the researchers of ISHU for the research and said that the communities along the Tharparker are extremely poor and the introduction of this grass in that area would provide an economic uplift to local communities. What is unfolding in Tharparkar has all the signs of a humanitarian catastrophe. But the PPP-led provincial government has underplayed the crisis. On paper, there are in total 390 health facilities in Thar, small and big, of which 288 are up and running – as 46 are under construction and 56 need to hire staff. But on the ground, those figures are greatly exaggerated. At least 40 percent of these facilities are out of order, estimate residents Geo.tv spoke to. Even if the building is there, enough doctors, nurses and medical practitioners are not available. The provincial government has yet to hire doctors to fill the 332 vacant posts in the district. Health problems are further compounded by lack of water and other basic facilities. Thar does not have a working irrigation system. People here are dependent on rainwater for drinking and other needs. Then, the prolonged season of dry weather, and less than normal rain, ravages the crops and food supply in the desert. In 2016, in the drought-affected Thar, 479 children died due to malnutrition, according to the health department. This year, in just the first three months, 82 children have already lost their lives. This data has been collected from the government hospitals. Local health experts insist that death in the far-flung areas of the district go unreported. The figures of mortality are alarming. What is unfolding in Thar has all the signs of a humanitarian catastrophe. Yet, the provincial government, led by the Pakistan People’s Party, has underplayed the crises. Officials have stopped providing media with updated figures of the death toll. In the past five months, the information flowing out of the district has been blocked. Mol Ram is a resident of the village Hilario in the desert. He is disappointed with the parliamentarians his people elected. LAHORE, Pakistan, Nov 24 (Thomson Reuters Foundation) - Most of Tajammul Abbas's 17 acres of farmland produces nothing but fodder for his buffalo and three goats. His land, and that around him in Punjab province, depends on rain to grow crops and rainfall has become much more uncertain as climate change takes hold, leading to lost harvests. But things are now looking more promising for him and for about 384,000 other people living in the Pind Dadan Khan-Khushab area, three hours drive from Lahore, Punjab's capital, after the government on Friday announced plans to build an irrigation system for the area. "Having a sufficient and effective irrigation system is fundamental in the development of Pakistan's agriculture sector, a significant driver of the country's economy," said Ryutaro Takaku, a water specialist at the bank's Central and West Asia Department. The project "will help increase agricultural production and improve food security in Pakistan", he noted in a press release. "There are about 128 structures that would need to be dismantled and land will have to be bought from people for the irrigation system. But there is no other option," said Muhammad Javed Iqbal Goraya, a water expert with South Asian Conservation Network, a non-governmental organization. In an area with poor rainfall, "irrigation (is) essential for crop production. The irrigation network will help the farmers in the area to adapt to climate changes and have more crops," he said. "Such associations and committees have been very helpful in some other areas of the country in managing watercourses and collecting water charges from users," Goraya said. The Sindh Small Dams Organisation of the provincial irrigation department has been building recharge and storage dams across the province. So far, 44 small dams have been completed and 30 are under construction to irrigate around 155,000 acres of land. In all, 70 recharge and four storage dams are to be built by the organisation. “If a dam in our village [Chanida] is filled like the Ranpur [dam], we can cultivate the onion crop on 200 acres,” Eidal Kumar tells this writer at the dam’s site in Nagarparkar. “Whatever water is currently available [in the Chanida dam] is used by livestock,” he adds. Recently, the multibillion-rupee Sindh Resilience Project was launched under which three small dams in Nagarparkar and 12 in Kohistan belt are to be built. The World Bank-funded project aims to mitigate flood and drought risks in selected areas and strengthen Sindh’s capacity to manage natural disasters. The Sindh government would share 20pc cost of the project. Of the Rs10bn cost, 80pc would be spent on small dams and 10 main river Indus’ dykes which needed refurbishment after recent floods. The accumulation of rainwater replenishes/recharges groundwater aquifers and then water is lifted through pumps by growers for rearing animals and cultivating crops. The sandy soil of Thar absorbs water quickly, but water table in groundwater aquifers around such dams gets improved considerably. “At some sites [of dams], groundwater level is recorded at 20 feet which was 100 feet before it rained in that area,” says Zahid Sheikh, an irrigation officer who was looking after small dams’ construction until recently. Besides recharge or storage dams, spate irrigation is another technique applied in areas located on the right bank of the Indus river such as Jamshoro, Dadu, Qambar-Shahdadkot and districts like Thatta, Khairpur and Malir. According to an old study conducted by the National Engineering Services of Pakistan, around 1.4 million acres could be brought under spate irrigation for cropping in Sindh, which has such 33 sites for water conservation of hill torrents. Small farmers of these areas have remained dependent on hill torrents during Kharif crops. Ashfaq Soomro of Research and Development Foundation said according to their study, improved structures of ponds can serve to reduce seepage and evaporation losses. Unfortunately, Sindh has not carried out a geographical study to develop comprehensive data set for a planned effective intervention. “Generally, communities in such difficult areas are left to deal with problems on their own,” commented an expert. Ahmad Zeeshan Bhatti of the Islamabad-based Pakistan Council of Research in Water Resources says a detailed mapping of Tharparkar is needed for determining potential sites to build rainwater harvesting. Since Thar’s soil is sandy, it increases the seepage ratio. Road catchment could be built to accelerate the pace of rainwater’s runoff after a cost analysis. India has installed solar panels in water bodies to block sunlight that otherwise accelerates the pace of evaporation. The wind velocity could be controlled by raising hedges around dams, he said. A proposal for mapping entire arid region was submitted to the federal government after hundreds of newborns died in Tharparkar in 2014 owing to malnourishment. The file has been gathering dust since then. The Sindh Governor Muhammad Zubair has said that the investment to the tune of dollars 4.5 billion in Thar is something very significant. He was expressing his views at an interactive session on energy held at the Governor House here on Friday. The Governor referred to the Thar coal reserves containing 175 billion tons and said that these would help meet country energy needs for a long time to come. The coal would not only be used for the generation of energy but would also be for provision of basic needs to the residents of the area. Zubair said that for the betterment of infrastructure 250- bed hospital as well as schools are also being built. The government is taking every step so that the people of Thar could benefit from the natural resources of the area. The Governor assured that the federal government would extend every cooperation for the welfare and betterment of the people of Thar. He informed that generation of power from Thar coal would commence from the year 2019 and this will contribute towards prosperity in the area. Zubair said that new avenues of development would also open in Thar. The Chief Executive Officer of Sindh Engro Coal Mine, Shamsuddin Shaikh, said on the occasion that 76 percent of jobs in Thar have been provided to the local people. He said that the time period of the project span over 42 months but it would be completed in 36 months. He said that first phase of the project would be executed in 2019. The company, he added, would also adopt all the schools in Thar. The company required 500 drivers and intermediate pass youngsters were provided training and appointed as driver with the company at the monthly salary of Rs. 30,000.